Bali's Tanjung Benoa beach takes up the east coast of South Bali, immediately north of the swanky Nusa Dua enclave of resorts. Unlike many other stretches of surf-friendly Bali coastline, Tanjung Benoa lacks the wave mechanics that bring in the Big Kahunas. 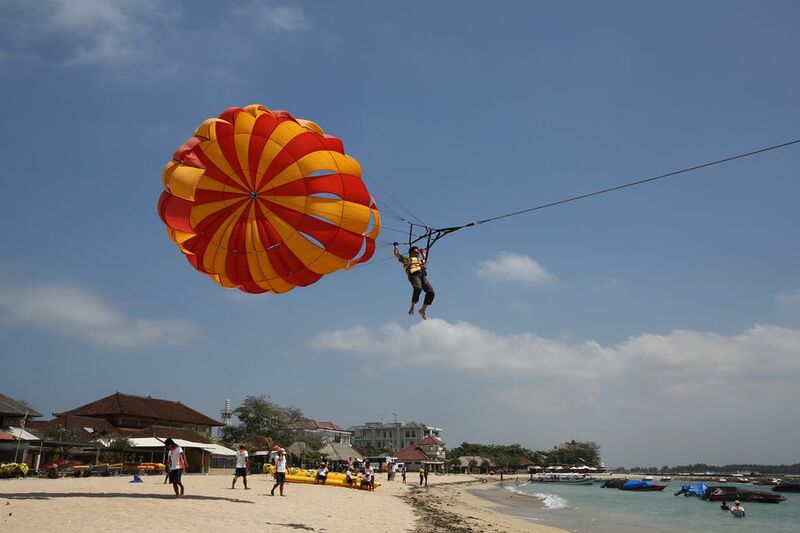 And perhaps that’s all to Tanjung Benoa’s benefit: while the waves are too weak for surfers, but just right for everything else you can do for fun on seawater (or below it). Charlie can’t surf, to misquote Col. Kilgore, but he sure can do almost everything else on the water. Tanjung Benoa is nowhere near as antiseptic as Nusa Dua, but it's nowhere near as rowdy nor as downmarket as Kuta, either. The area vibe is more mature and family-friendly – surfers tend to steer clear of Tanjung Benoa's sedate waves, leaving the waters clear for kayaks, jetskis, parasailers, and banana boats. Jalan Pratama, the main road servicing the resorts and hotels lining Tanjung Benoa beach, runs vertically from south to north, if you're coming from the airport. The road is lined with an ample selection of restaurants, spas, moneychangers, and clothes shops on the west side of the street and a number of resorts fronting the beach on the road’s east side, ranging from the classy Conrad Bali (compare rates) to more affordable options like the Core Hotel Benoa (compare rates). The northern tip of Jalan Pratama leads to a fishing village, transitioning from Tanjung Benoa's tourist stretch into the backstreets populated by the locals. The streets west of Jalan Pratama make up a thriving Balinese community, with a temple at the northern tip and a bustling port down the west coast of the peninsula. Watersports providers offer plenty of options (and plenty of competition) to ensure a wide range of affordable options. Most providers package any of the following into their services – banana boat rides, waterskiing, parasailing, wakeboard, and scuba diving. You can compare different providers to get the price you want. Both Pura Taman Beji and Klenteng Caow Eng Bio are within a short distance of one another, so many visitors see both on the same trip. Jalan Pratama is lined with restaurants of all sizes and budgets. The bigger hotels have their own dining establishments, some of which are notable enough to attract outsider attention. For a fine Balinese dining experience, go to Bumbu Bali (Jalan Pratama, Google Maps; Phone: +62 361 774 502; balifoods.com). Bumbu Bali was recognized by the Miele Guide as one of its five best Indonesian restaurants. You can't go wrong with the Bumbu Bali's rijstaffel. For a more contemporary bar and party experience, go to Sakala (Jalan Pratama 88, Tanjung Benoa - Google Maps; phone: +62 361 774 499; sakalabeachclub.com), a pleasantly modern place on Tanjung Benoa for drinks and seafood. For modern Asian cuisine, try Tao Bali (Jalan Pertama 96, Tanjung Benoa; phone: +62 361 772902, taobali.com), a beachfront restaurant serving a selection of Vietnamese, Chinese and Thai favorites in a romantic al fresco setting highlighted by the curvy pool at its center. Tanjung Benoa's hotels and resorts are positioned mainly on the eastern side of the peninsula, where the beach catches the rising sun. The tame currents on Tanjung Benoa beach create a perfect resort setting for the establishments sprouting up along the coastline; many of them offer watersports and other activities perfectly suited for the waves. Family friendly resort: check into the Grand Mirage Resort (compare rates), a sprawling four-storey, 310-room beachfront resort with a kids' club, massive swimming pool, and access to both motorized and non-motorized watersports. Their all-inclusive stays provide almost unlimited access to the resort's amenities, for about 80% more than the usual price. Luxury accommodations: check into the Conrad Bali (compare rates), a luxury beachfront resort with 353 guestrooms offering panoramic views of the ocean. Located within 6.8 acres of tropical gardens and lagoons, the Conrad has cascading waterfalls and a beachfront wedding chapel set out on an ocean jetty. Budget option: the Core Hotel Benoa (compare rates) offers 24 rooms, some overlooking a small pool. Tanjung Benoa beach is a three minute walk away. Free Wi-Fi is available throughout the property. Tanjung Benoa’s coastline may be vulnerable to tsunami – if that’s a concern, read our article on tsunami-ready hotels in Bali. For other accommodation options in Tanjung Benoa, Bali, compare rates via Tripadvisor. Tanjung Benoa is not particularly famous for its shopping scene – while the street has a fair number of art markets and clothes shops, the shopping at Jalan Legian offers far more variety and value. Do try walking down the western side of the street and explore their selection of art, jewelry, and clothes (both genuine and fake). The nearest shopping mall to Tanjung Benoa is the Bali Collection in Nusa Dua, which is part of our list of shopping malls in South Bali. A free shuttle bus connects the hotels of Tanjung Benoa and Nusa Dua with the Bali Collection. For shopping opportunities close by, check out our article on shopping in South Bali; or read our summary of the Bali shopping scene. Tanjung Benoa is close to Bali’s airport, about a twenty-minute drive away in minimal traffic but up to an hour away in heavy traffic conditions. Jalan Legian in Kuta is about a 30-45 minute drive away from Jalan Pratama.